1. pertaining to or resembling a hair. 2. in the circulatory system, one of the minute vessels connecting arterioles and venules, the walls of which act as a semipermeable membrane for interchange of various substances between the blood and tissue fluid. Capillary walls consist of thin endothelial cells through which body fluids and dissolved substances can pass. At the arterial end, the blood pressure within the capillary is higher than the pressure in the surrounding tissues, and the blood fluid and some dissolved substances pass outward through the capillary wall. At the venous end, the pressure within the tissues is higher and waste material and fluids from the tissues pass into the capillary, to be carried away for disposal. arterial capillary a vessel lacking complete coats, intermediate between an arteriole and a capillary. Called also precapillary. venous capillary a type of minute vessel that lacks a muscular coat and is intermediate between a venule and a capillary. Called also postcapillary. 1. Resembling a hair; fine; minute. 3. Relating to a blood or lymphatic capillary vessel. 2. one of the minute vessels connecting the arterioles and venules, the walls of which act as a semipermeable membrane for interchange of various substances between the blood and tissue fluid. Capillary bed, showing the connection between the arterial and venous capillaries. 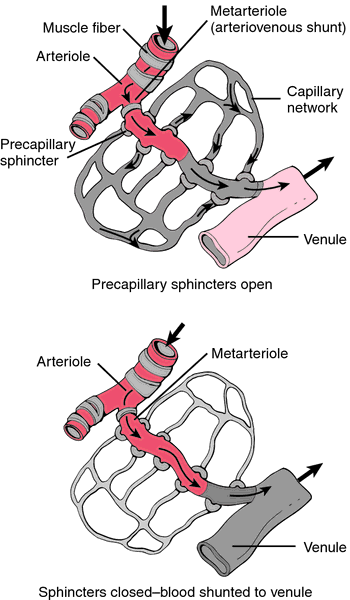 arterial capillary precapillary; a type of minute vessel lacking a continuous muscular coat, intermediate in structure and location between an arteriole and a capillary. continuous capillaries one of the two major types of capillaries, found in muscle, skin, lung, central nervous system, and other tissues, characterized by the presence of an uninterrupted endothelium and a continuous basal lamina, and by fine filaments and numerous pinocytotic vesicles. fenestrated capillaries one of the two major types of capillaries, found in the intestinal mucosa, renal glomeruli, pancreas, endocrine glands, and other tissues, and characterized by the presence of circular fenestrae or pores that penetrate the endothelium; these pores may be closed by a very thin diaphragm. lymph capillary , lymphatic capillary one of the minute vessels of the lymphatic system. secretory capillary any of the extremely fine intercellular canaliculi situated between adjacent gland cells, being formed by the apposition of grooves in the parietal cells and opening into the gland's lumen. venous capillary postcapillary venule; a type of minute vessel lacking a muscular coat, intermediate in structure and location between a venule and a capillary. 1. Relating to or resembling a hair; fine and slender. 2. Having a very small internal diameter: a capillary tube. 3. Anatomy Of or relating to the capillaries. 4. Physics Of or relating to capillarity. 1. Anatomy One of the minute blood vessels that connect arterioles and venules. These blood vessels form an intricate network throughout the body for the interchange of various substances, such as oxygen and carbon dioxide, between blood and tissue cells. 2. A tube with a very small internal diameter. one of the microscopic blood vessels (about 0.008 mm in diameter) joining arterioles and venules. The wall consists of a single layer of endothelial cells, which are specialized squamous epithelial cells. Blood and tissue fluids exchange various substances across these walls. Any of the microscopic blood vessels that connect minute arterioles and equally minute venules. Capillaries form a network throughout the body and are the functional unit of general circulation. Capillary walls are semipermeable and allow passage of O2, glucose and other nutrients from the blood into the cells, and waste products (CO2, NH3) into the blood to be excreted or eliminated through the lungs. 2. 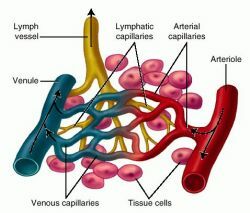 A capillary vessel; e.g., blood capillary, lymph capillary. 1. Any of the minute blood vessels, averaging 0.008 mm in diameter, that connect the ends of the smallest arteries (arterioles) with the beginnings of the smallest veins (venules). 2. Pert. to a hair; hairlike. One of the very small vessels that are the terminal branches of the arterioles or metarterioles. One of the intercellular biliary passageways that convey bile from liver cells to the interlobular bile ducts. Also called bile canaliculus. One of the minute blood vessels that convey blood from the arterioles to the venules and form an anastomosing network that brings the blood into intimate relationship with the tissue cells. Its wall consists of a single layer of squamous cells (endothelium) through which oxygen diffuses to the tissue and products of metabolic activity enter the bloodstream. Blood capillaries average about 8 μm in diameter. Any of the very small canaliculi that are part of the secretory outflow path receiving secretion discharged from gland cells. One of the minute vessels that convey blood from a capillary network into the small veins (venules). The smallest and most numerous of all the blood vessels. Capillaries form dense networks between the arteries and the veins, and it is only in the capillary beds that interchange of oxygen, carbon dioxide and nutrients can take place with the cells. Fig. 88 Capillary . 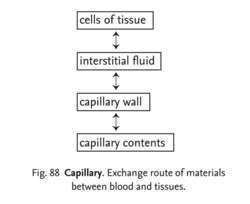 Exchange route of materials between blood and tissues. Fig. 87 Capillary . 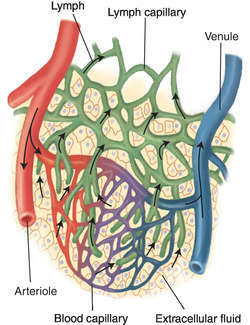 The structure of a capillary vessel. blood flow is slow, allowing maximum time for exchange. The tiniest blood vessels with the smallest diameter. These vessels receive blood from the arterioles and deliver blood to the venules. n the terminal vessels uniting the arterial with the venous systems of the body. They are organized into extensive branching reticular beds to provide a maximal surface for exchange of fluids, electrolytes, and metabolites between tissues and the vascular system. n the quality or state that, because of surface tension, causes elevation or depression of the surface of a liquid that is in contact with a solid. Considered to be one of the factors in retention of complete dentures. 2. one of the minute vessels connecting arterioles and venules, the walls of which act as a membrane for interchange of various substances between the blood and tissue fluid. (See circulatory system.) The walls consist of thin endothelial cells through which dissolved substances and fluids can pass. At the arterial end, the blood pressure within the capillary is generally higher than the pressure in the surrounding tissues, and the blood fluid and some dissolved solid substances pass outward through the capillary wall. At the venous end of the capillary, the pressure within the tissues is generally higher, and waste material and fluids from the tissues pass into the capillary, to be carried away for disposal. See starling's hypothesis. a capillary with no pores or other interruptions in the endothelial walls, e.g. in muscle, lung, nervous system. capillaries with pores are scattered throughout the endothelial walls, e.g. in endocrine glands, intestines, kidneys. the smallest lymphatic vessel. Consists of an endothelial tube embedded in connective tissue. ability of large molecules to pass out of the capillary lumen into surrounding tissue spaces; inflammation, allergy, poisoning, burns cause increased permeability resulting in plasma leakage and edema in surrounding tissues. the time required for mucosa (oral in horse or dog, vaginal in cow, sheep) which has been blanched by finger pressure to return to a normal pink color. Failure to return promptly is an indication of peripheral circulatory failure, due for example to dehydration or hypovolemic shock. part of the vasculature of avian skin. Occur together with standard capillaries but they are larger in diameter and may have some smooth muscle cells associated with the endothelial cells. large and irregularly shaped; occur in endocrine glands, aortic and carotid bodies. Over 300 marquee brands across 30+ countries, including Pizza Hut, VF Brands, Kanmo Retail Group, Bata, KFC, McDonald's, Charles & Keith, Starbucks, Courts and Samsung, trust Capillary to enable easy and seamless consumer experiences. Capillary blood ketone was measured at the bedside and the results were noted in patients' file. Few other case reports also mentioned occurrence of lobular capillary haemangioma at rare sites. in 1980 termed pyogenic granuloma as lobular capillary haemangioma, based on its characteristic histopathological finding. Capillary density was expressed as capillaries/fiber ratio. The team argued that, regardless of what happens at the tip, capillary suction is important in drawing nectar up the grooves. Histopathology shows a vascular tumour with well-formed capillary lumina. Pulmonary capillary wedge pressures are normal, reflecting normal postcapillary pressures and left atrial function. The company stated that this capillary is based on its latest and most advanced ceramics composite platform, for improved wear resistance, extended life span and superior copper wire bonding quality. Micro- capillary usually comes with graduation marks for every microlitre that assist the observation of capillary action up to a certain volume. Another important aspect of flow through capillary tube is the existence of metastable region between subcooled liquid region and two-phase region. Capillary telangiectasias may be differentiated from the other CNS vascular malformations in that they are usually benign, asymptomatic, and small, ranging from a few millimeters to 2 cm (1,2,3) in size.